For the past few weeks I have been reviewing a wonderful new cookbook called BITE ME by sisters Julie Albert and Lisa Gnat and today I get to share some information with all of you about the cookbook which is a nice thick soft-cover 272 page book. ISBN: 978-1-906868-44-4 and the cover price is $24.95. Synopsis (About the Cookbook): Saucy sisters Julie Albert and Lisa Gnat are somebody, alright. Julie's a busybody who lives for laughs, pop culture, music, photography and entertaining you in and out of the kitchen. Lisa is a homebody whose bionic nose and supreme palate have fueled her passion for eating and feeding and helped her conquer the age-old "What's for dinner?" dilemma. Together, these gut-busting (in all ways) girls are everybody...like everybody they want to feast on extraordinary eats, marvel in merrymaking and guilt-free, tell one and all to "Bite Me." My Thoughts on the Book: The book is broken down into 10 chapters: Grab Me Appetizers, Spoon Me Soups, unDress Me Salads, Respect Me Vegetables, Crave Me Pasta & Rice, Gobble Me Poultry, Catch Me Fish, Meet Me Meat, Join Me Brunch and Fork Me Dessert. Just reading those make me giggle! When I read through the book I found myself laughing every couple of pages as these two sisters are funny and crack you up...nice to see humor displayed in a cookbook! I love that these recipes use easy to find ingredients and the directions on how to prepare the recipe are in easy...so even the beginner cook can prepare them. The color photographs in the book of the food dishes are nice and large and I love seeing food photos as it gives you ideas on how you can present the item you made. Everything about this cookbook is top notch and it would make a great addition to your cookbook collection. Matter of fact, it has quickly become one of my favorite cookbooks! 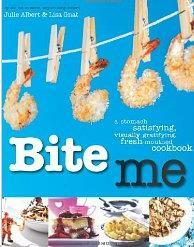 You will find everything in this book from appetizers, main dish, side dish and desserts along with things in between! Just looking at their photos will make you hungry so I highly recommend this cookbook to you! I would like to thank the girls for the opportunity to review their fabulous Bite Me Cookbook! This is a great addition to my cookbook library!